When a washing machine is finished filling with water, a control valve will in an instant stop the flow of water into the machine. The sudden stoppage of the flow of water causes a pressure surge in the water supply lines. This phenomenon is known as water hammer. Homeowners become used to hearing the noise or banging associated with water hammer and never consider the possible problems that it can cause. Until recently most homeowners connected their washing machines using rubber water supply lines. It has always been recommended to replace these supply lines at least every five years because as the rubber ages these lines lose their flexibility. Older supply lines that do not get replaced can be subjected to regular surges from water hammer and eventually fail. 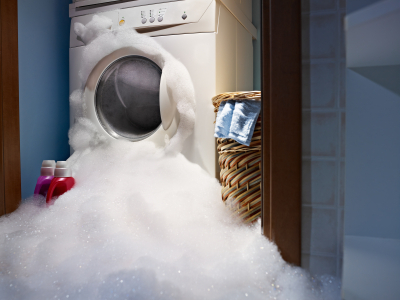 A burst washing machine supply line can do serious damage to your home in a matter of moments. If you're lucky enough to be home when this happens, it is crucial to turn off the water as soon as possible to prevent further damage. The shut-off valves for washing machines look just like the spigots that you may see on the outside of your home. They are located behind the washing machine. There will be two separate connections, one for the hot water, and one for the cold. 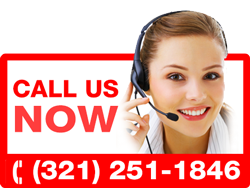 In the event of a Washing Machine Plumbing Emergency, OrlandoEmergencyPlumber.net has water damage restoration professionals on call to respond to your emergency. Our professionals can help you clean up the mess as quickly as possible and restore your home back to its original condition.